Quantifiable research plays a substantial role in informed policy formulation and monitoring of its effectiveness. The factors that contribute to the lack of development of SME sector in Pakistan are well-known but lack the support of concrete data and quantifiable research, making the task of securing the attention of policy makers and key government stakeholders difficult. Such a vacuum in SME related policy research hinders the performance measurement of policy interventions as there is insufficient information to ascertain whether targeted initiatives have made any contribution to growth and development. 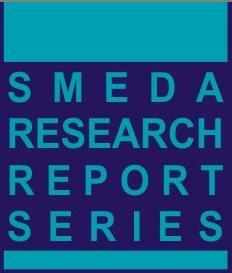 In view of the above, SMEDA has initiated a dedicated journal of economic research specifically tailored to the dynamics of Pakistan’s SME sector. This foray into the world of research is an attempt to draw on SMEDA’s own survey efforts and also takes into account studies conducted by other development organizations, institutions and researchers.